The two-bedroom cottage Laurel is ideal for those searching for a stress-free, low-maintenance home. 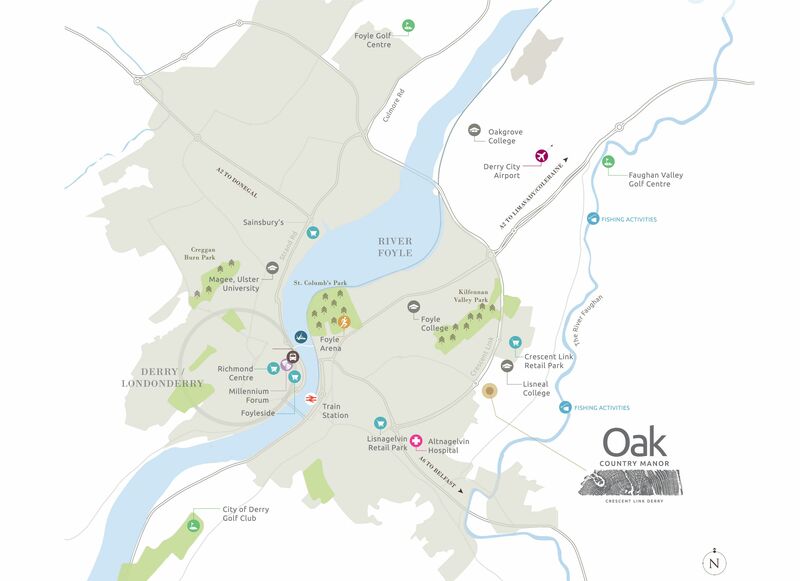 Oak Country Manor is in an excellent location to access the best of the North West. It is a mere two min drive to Crescent Link Retail Park which includes pharmacies, supermarkets, home improvement stores, coffee shops and fitness centres. Further afield, the Foyle Arena & Gym can be found within the grounds of St Columb’s park 8 minute drive away. With their state of the art climbing wall, gym and swimming pool you are guaranteed hours of enjoyment, suitable for all ages. The development is surrounded by the city’s main transport links: 7 minute drive to the train station, and the A6 from your doorstep to Belfast. Some of the city’s best education establishments such as Ulster University and Northwest Regional College are only a 10 minute drive.